Released on this day in 1988, Iron Maiden’s seventh studio album, Seventh Son of a Seventh Son, celebrates it’s 30th anniversary. I well remember queuing up, with my £5.49, or whatever the price of an album was back then, at Haken and Bell in Abingdon, to get my hands on this record, the follow up to 1986’s Somewhere In Time. As a denim wearing, long haired 16 year old, about to do my GCSE’s Iron Maiden were a band that were continuously on my turntable that spring/summer as I revised for my exams, the volume up loud (much to the consternation of my father who could never understand how heavy metal was ever conducive to revision and study) helping me through those stressful days. Seventh Son was, in many ways, somewhat of a new direction, including, as it did, keyboards and more collaborative writing as leader and bassist, Steve Harris, included singer Bruce Dickinson and guitarist Adrian Smith, in the song creation process. Much of this came from necessity as Harris worked around the concept of the folklore of the mystical attributes of a seventh son of a seventh son, with Dickinson, in particular, being able to develop the idea further. This was also important to Bruce as he’d been feeling somewhat ‘back-seated’ as purely the hired singer as opposed to being a full member of the band. 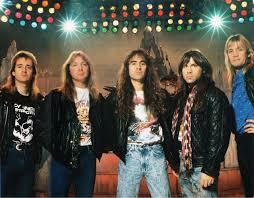 The album also saw Iron Maiden move, along with other contemporaries as Def Leppard, into the realms of the chart world. 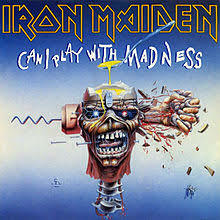 The first single, Can I Play With Madness, reached number 3 in the UK charts, and with it exposure for the band via TV programmes like Top of the Pops. This did lead, in some die-hard fans eyes, a certain level of sell-out and commercialisation although it can also be said that it also opened a lot of peoples eyes to the great music that was being made by the maturing new wave of British metal. 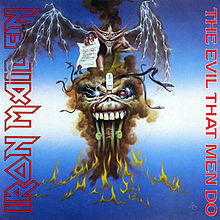 Saying that, the album didn’t do as well as hoped in the US market, with the main criticism being that, with its more progressive concept album feel, it was too European, a criticism that Steve Harris was both quick to disagree with and counter. As ever Maiden set about touring the album intensively with highlight gigs at huge festivals as the Donnington Monsters of Rock underlining their power as one of, if not the, best live rock acts of the time. However, this was the beginning of the end of the ‘classic’ 80’s line up of Harris, Dickinson, Smith, guitarist Dave Murray and drummer Nicko McBrain as Smith left the band in the pre-production stage of 1990’s No Prayer for the Dying which he felt wasn’t building on the progressive direction of Seventh Son. Bruce Dickinson also left the band soon after though both him and Smith re-joined in 1999. 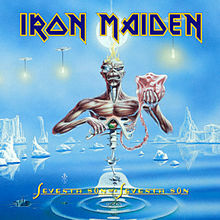 Seventh Son is a seminal album in the history of not only Iron Maiden the band but also the history of British Heavy Metal and perhaps should always be seen as the point at which that music grew up, along with many of its fan’s including the sixteen year old me. It certainly was, along with the Marillion albums I was listening too, responsible for my travels into more progressive rock music; a journey that led to Yes, Emerson, Lake and Palmer and King Crimson among many other bands. A great album that stands the test of time and sounds as good today as it did when I first played it on April 11th 1988. That’s a good point Adam, but in many ways it could been seen as a strength. They were certainly, by 1988, a band that had developed and perfected their sound, leading to them becoming a brilliant live act. Monsters of Rock in 88 was an amazing performance. As the years go by, perhaps that becomes a level of showmanship over trying to do new stuff, although the Book of Souls album was a very good development? I certainly played my version the moment I got to my turntable! I wouldn’t have been able to wait 2 weeks!! They had, of course, scared the top 10 with Run to the hills! Scared is probably the right word…Top of the Pops crowds sure as hell didn’t know what had hit them!